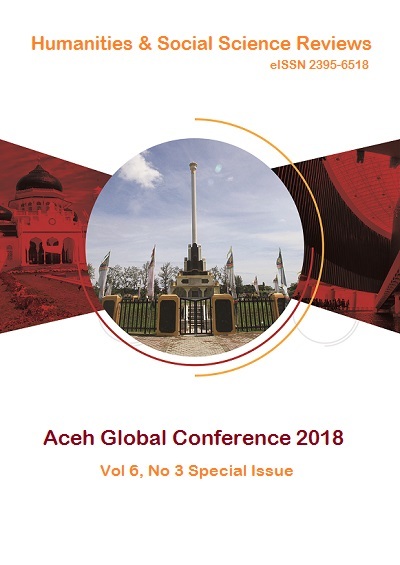 Vol 6 No 3 (2018): Aceh Global Conference, 2018 (Special Issue) | Humanities & Social Sciences Reviews Articles invited for Vol 7, No 2 issue. Upload before 30th May 2019 in Make a Submission tab. BEST (Business Economic and Sustainable Development Trends). 17-18, 2018 in Banda Aceh, Indonesia. Sabihaini ., Awang Hendrianto Pratomo, Heru Cahya Rustamaji, Sudaryatie . Sujianto ., Syofian ., Ikhsan . Alif Azadi Taufik, Farnanda .